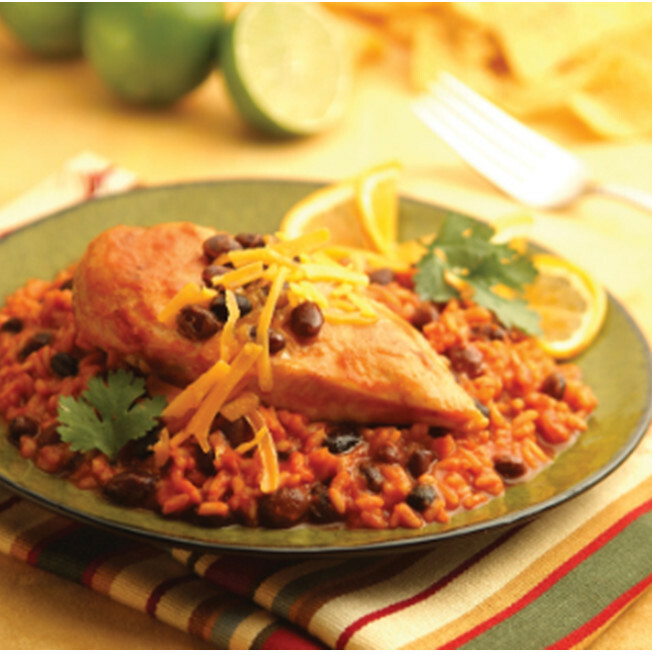 Enjoy the taste of Mexico with this simple, warming dish that's as nutritious as it is tasty! Heat 1 tablespoon of vegetable oil in a 10-inch frying pan over medium-high heat. Add the chicken and cook for 10 minutes or until it’s browned on both sides. Remove from the frying pan and set aside. Reduce the heat to medium and add the remaining oil. Add the rice and cook for 30 seconds, stirring constantly. Introduce the V8 Juice, cumin and chilli powder then heat to a boil. Reduce heat to low then cover and cook for 15 minutes. Stir the beans in the frying pan & reintroduce the chicken. Sprinkle the chicken with cheese. Cover and cook for 5 minutes or until the chicken is cooked through, the rice is tender and most of the liquid is absorbed. Why not rate this recipe? © 2017 Kelsen Group A/S. All Rights Reserved.